A Free Editable Grocery List Template That Will Cut Plan Time In Half! This grocery list template is just the thing to make your shopping list less dreaded. But I’ve got another trick that makes it even easier! I stood at the pantry door and sighed in frustration. I’d already run out of eggs and peanut butter, but was doing ok without them. But now I was out of cereal (my go-to plan for when there’s “nothing to eat”) and laundry detergent, too. It was time to face the fact that I had to do some grocery shopping. Going grocery shopping ceased to be a quick trip long ago. No, these days we have to meal plan, cut coupons, and write a detailed grocery list before we even leave home. It’s the only way to keep the grocery budget in check. Don’t get me wrong! Those things are totally worth it. So sure, the extra work to create a grocery list is worth it in the end. But does it have to be so tedious? Trust me, I felt that way for a long time. But then I stumbled upon a simple trick. Before I share that with you, consider this…what if you already had half of the job finished ahead of time? It’s a very simple step I like to call using a grocery list template. I’m willing to bet that like me, you’re a creatures of habit. For example, maybe you tend to buy the same foods week after week. But there are probably other things your family expects to have on hand most of the time. Every family has their own habits and favorite foods. And as CEO of the family (you probably also go by “Mom”), you know what those favorites tend to be. We aren’t talking about visiting Pinterest for new, exciting recipes to try. We’re talking about writing down the foods that your family happily eats every week…or even every single day! Grab a pen and paper (or open an app if you’re a tech savvy kind of person). First, step into your kitchen and look around. What do you nearly always have on hand? Are there foods that you eat regularly? What are ingredients you always reach for? Some food items probably come right to mind! These are thing you have to buy on nearly every single shopping trip. The next thing to do is close your eyes and mentally enter your grocery store. What do you grab in the produce section? In the meat and seafood aisles? Etc. Now keep this list handy for the next few days. As you cook and eat, keep an eye out for foods that you use frequently. Now that you have your list, you can get started on your own printable grocery list template! To keep things simple for you, I’ve pulled together two grocery list templates. All you need to do is save a copy of the template. Then take the list you created earlier (remember the instructions above?) and use it to fill in the blanks on your own free printable grocery list template! You can download your own Microsoft Word document of grocery list template here. Grab a Google Doc of the grocery list template instead. Simply click that link. Then go to “File”, select “Make a Copy” and type whatever name you’d like to title your list. Then you’re free to make any changes you’d like. Or start from scratch with a blank copy. Grab a Google Doc of the grocery list template instead. Simply click, then go to “File”, select “Make a Copy” and type whatever name you’d like to title your list. Then you’re free to make any changes you’d like. Once you have created your standard grocery list using the list of items you buy regularly, you can make copies of it or save it to your computer. The next time you need to hit the grocery store, print off a new copy. Write down only what special items you need for this particular shopping trip. You’re ready to go! This grocery list template will save you a ton of time! The next time you are out of everything (even cereal! ), you can relax. 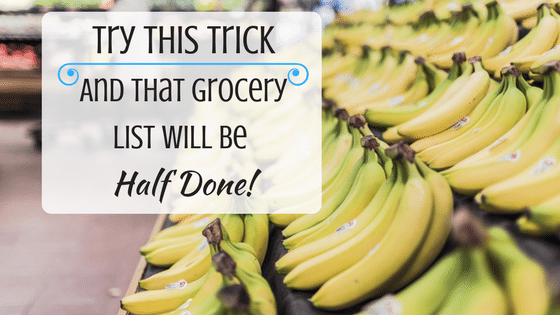 Your planning for the next big grocery trip is already halfway done! 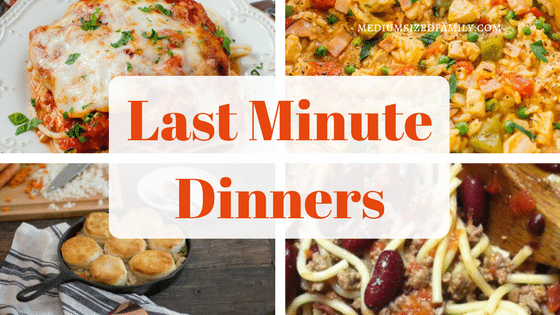 These last minute dinner ideas will give you some inspiration for the rest of your list! What kind of items would you put on your standard grocery list? This grocery list template is just the thing to make your shopping list less dreaded. But I've got another trick that makes it even easier! We tend to do the haphazard shopping with a shopping list on the fridge and buy as we need and big shops see and grab as we walk up the aisles, but yes organised shopping from an organised proper list a definite money saver. Yep, I definitely have times that I do haphazard shopping myself. I’m more likely to follow through with tasks like this when I make it as easy on myself as possible. Thanks for the kind comment and for hosting the link up! This is a great idea! I never even made grocery lists until I started meal planning a couple months ago…now I don’t know how I ever lived without them!!! This is a fantastic idea. It seems so simple, yet I had never thought of it. I’m glad you shared it. It’s funny how the simplest ideas can help so much sometimes! Thanks for visiting! 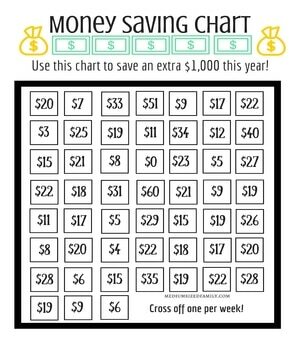 What a great time-saving idea! I’m going to try this out the next time I make my list 🙂 Thanks for sharing at the Welcome Home Wednesdays link party; we hope to see you again next week! Great idea!! Love this since I need to be more consistent with my shopping! Thanks for sharing! Hi from Pin Worthy Wednesday! Having a list helps keep me somewhat focused. I keep meaning to make a standard list based on the layout of our grocery store so I can follow my list in order as I shop. It really does save time in the long run. Thanks for visiting! Visiting from the Welcome Home Wednesday linky party. What a wonderful idea. I love the walking through the grocery store in your mind as you’re making out the list. I do the same thing, it keeps me that much more organized. Sadly my next shopping trip won’t be so easy; we just got a new grocery store that I don’t know that well yet but they have some amazing prices, super excited. Woohoo for a store with amazing prices! I’d be super excited, too! Maybe you can use your receipt to help you make a basic list for the next time? I shop monthly…and this is brilliant. Thanks! I used to shop monthly. Lately I have been wondering if we are getting to a life stage where I can do that again. And thanks! Good idea 🙂 I know there are lots of things I buy every week that could go on a standard grocery list and save me the time and mental energy of having to remember and write them down every week. I am really bad at making grocery lists but it makes such a difference when I do. I sort of keep a mental version of our standard items but it’s not like writing them down. I should totally do this. I did the same thing for the longest time. But I do so much better when it’s written down! I live too far from the grocery store to forget things. Thanks for visiting! Hi, Jamie ~ I love this idea! And it’s a huge time and sanity saver. 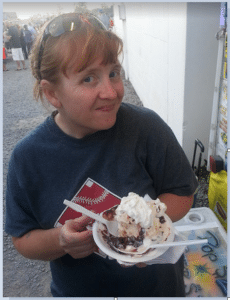 Thanks for sharing with us at the Merry Monday Link Party!! Maybe because it’s just my partner and I, we don’t really have a standard list. We buy a lot of different things each week. But I can imagine that when you have more people in the house, you can’t escape. Yeah, more people definitely requires more organization! Thanks for hosting the blog hop! Great suggestion, Jamie! I’m in the process of making something similar. Especially for toiletry items, I like knowing the best price I can pay for them, and then I try not to buy until the price is low again (which means I stock up). With food items, it is really helpful to know which stores have the best regular prices on the items on our shopping list. So I’m creating a sort of master stock-up list that goes along the same lines as your suggestion. Anything to prevent mental overload, right? Thanks again! This is a great idea. I wrote down items that I need throughout the week. This meal planner would be a great way to keep my list organized. Thanks for sharing on Sunday’s Best. It definitely makes my life simpler! This really makes sense. There are certain things that I buy every month. Usually, I am able to stock up on them when they go on sale throughout the month. But I like your idea of making a standard list. I have found it amazingly helpful! Simplify any way you can, right? Good idea. I have done this for many years and over time the list seems to change and needs updated. It does help to stay organized and save money. Oh yes, our needs definitely change over time. That’s why I like having a digital copy so I can modify and print it as needed. Thanks for visiting! Featuring this post at Free and Fun Friday tomorrow! 😀 Thanks again for linking up!! Love this idea, especially for getting started when you aren’t sure what to put on your list.